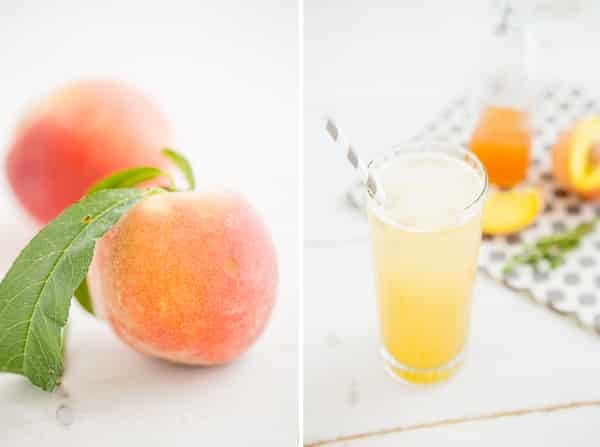 Peach Thyme Syrup Recipe for drinks from Oh My Veggies! There was a time, many years ago, when I only drank soda. Once in a while, when I was feeling like I wanted to be healthy, I’d drink juice too. But not juice juice–the kind of juice that’s pink and refrigerated and has all sorts of flavors and colors in it, but actual fruit is about tenth on the list of ingredients. I didn’t like the taste of water, so I didn’t drink it. Ever. Then I realized the ridiculous amount of empty calories in soda and I cut myself off cold turkey. No more! For several years, I stuck to this but now I drink it again once in a great while. You know how every so often, you just crave a brownie or a chocolate bar? That’s how I feel about soda now. It’s a treat! Not an everyday thing. I try to buy brands made with natural ingredients, but my favorite soda is homemade soda. We have a SodaStream, which I love, but I’m not a big fan of the syrups, which are made with artificial sweeteners and taste off to me. So we use the SodaStream to carbonate water and I make my own syrups. Which sounds really intense, I know! And if you’re rolling your eyes right now, I don’t blame you! But making your own syrups is easy. It’s just a matter of combining fruits, herbs, and spices with the right amount of sugar. It’s impossible to walk two feet at the farmers market and not bump into pints and pints of peaches right now. 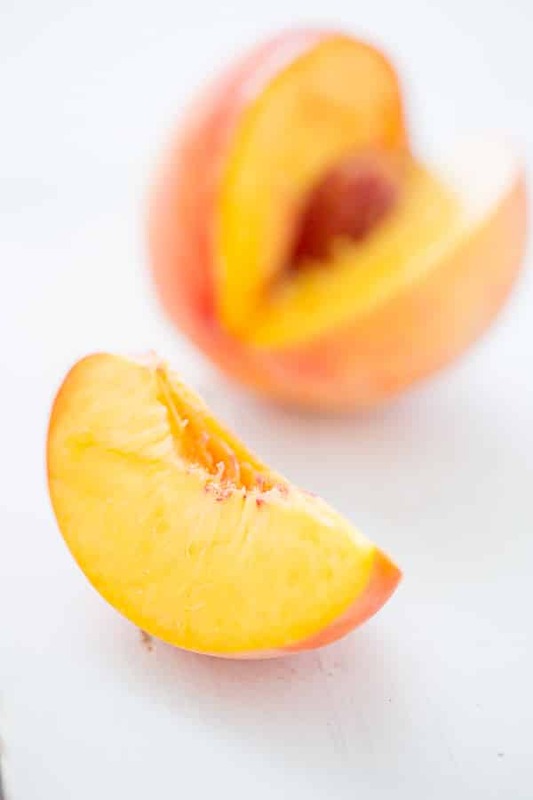 The farmers market peaches aren’t as plump and perfect as the ones you buy at the store, but they always seem to be sweeter and at the peak of ripeness. I love adding an herbal note to syrups, so I added several sprigs of thyme too. 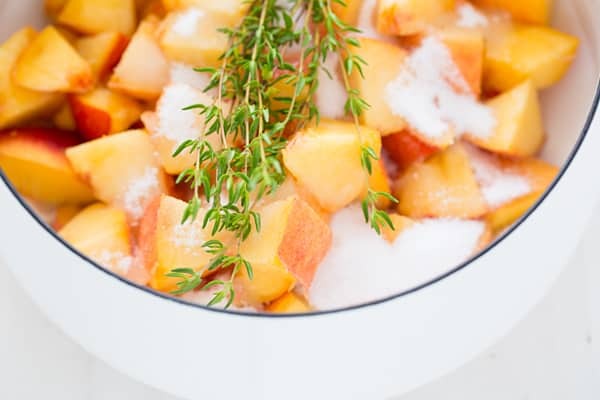 You combine the peaches, sugar, and thyme and let them cook down until the peaches are soft and the liquid is thick, then you strain the mixture and hello Peach Thyme Syrup! I like Italian sodas because they’re not overly sweet, so I usually pour a little syrup at the bottom of a glass and then pour sparkling water on top. But this syrup can also be used to sweeten iced tea or lemonade instead of sugar! The recipe only makes about a cup of syrup, so if you’re making a big batch of tea or lemonade (or if you like your drinks extra sweet), you might want to double the recipe. 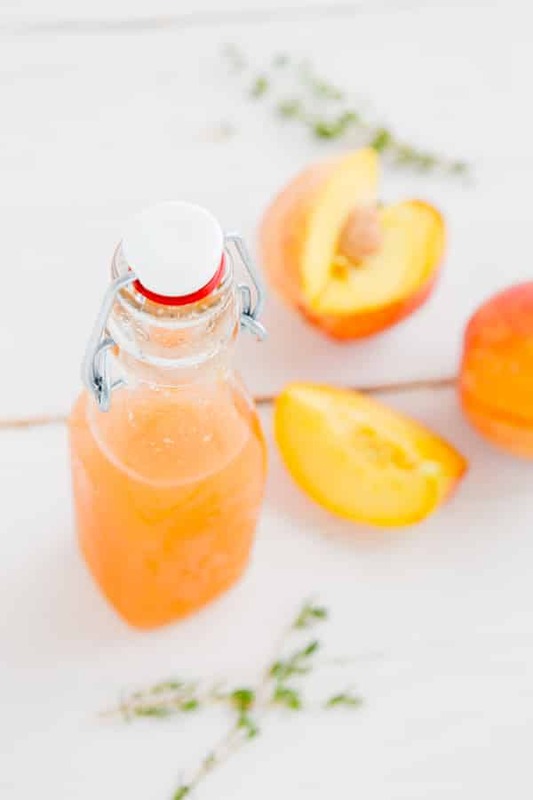 A sweet, herbal syrup made with fresh summer peaches. It’s perfect for adding to sparkling water, lemonade, or iced tea! Combine all the ingredients in a large saucepan. Bring to a boil, then reduce heat to low and cook for 30 minutes. Every few minutes, stir the pot with a wooden spoon and use it to smash the peaches a little bit. Strain the syrup into a bowl using a fine mesh sieve and discard the solids. Transfer the syrup to a bottle or jar and refrigerate for up to a week. I’m going to have to try that–I have a LOT of mint growing on my porch right now! I know what you mean about soda – I don’t drink it much, but sometimes I just get a craving for coke zero and nothing else will quench my thirst! Good idea to make your own syrups so you can use natural ingredients control how much sugar goes in. I think peaches go really well with herbs too! The same thing happens to me–once in a while, I get thirsty and I feel like the only thing that will quench it is soda. So weird! Hi! I’m a new visitor, but this peach syrup recipe drew me in because I like anything with peaches! Your photos are gorgeous, and your layout is nice as well. I shared this recipe with my followers at Facebook.com/theyummybits, hopefully they like it as much as I do! Thanks for sharing! Mmm! Just picked up a ton of peaches (okay, that might be a slight exaggeration but it’s still more than any two people need). You already saw my peach pie recipe, but I think I’m going to have to try making this too! I love making fresh lemonade and this will be perfect with it. I have a lot of mint right now, I hope it goes as well as the thyme. 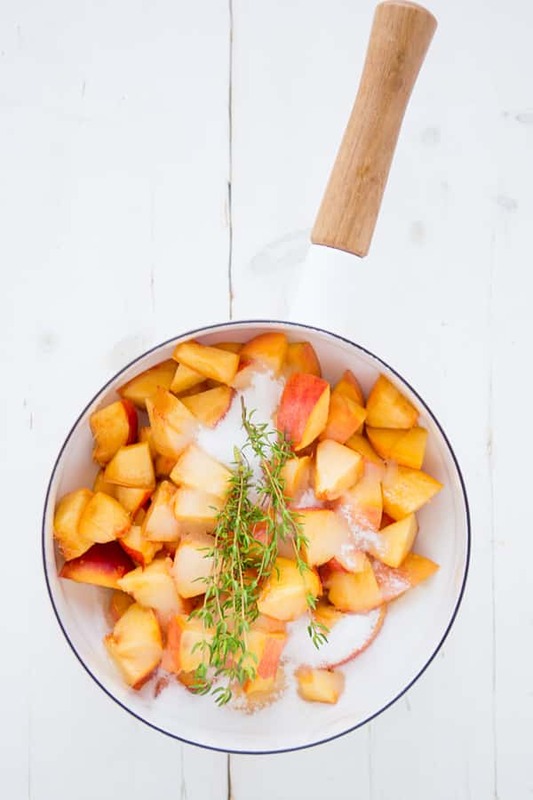 I definitely appreciate the sweetness of peaches but their full bodied flavor complements savory herbs so well! I love making syrups and using them to make drinks. I never thought to make soda though! Wonderful idea. I love the sound of peach thyme syrup. YUM! We are both geniuses. 😉 Peaches bruise SO easily and using them in syrup is the perfect way to use them up. How much syrup do you get from this recipe? I need 200ml of syrup to make a sorbet. It makes about 1 cup. The Sorbet I made from it is really delicious. I made the syrup, added 2 cups of water and 2 tablespoons of lemonjuice! That’s my kind of soda! There’s only one traditional soda I like and it’s horrible for me. Something more natural and that can be added to sparkling water sounds so refreshing! I don’t like most traditional sodas anymore either. For some reason, whenever we travel, I always crave Sprite though. Like in airports or on car trips? Always Sprite. Can you do this with a stevia replacement? How much would you use? Just started following your site and I love it! I don’t think you can make a simple syrup with stevia — it probably wouldn’t melt and get syrupy like sugar does. But I haven’t cooked much with stevia, so I could be wrong! I too bought a box of peaches, have about a dozen that I wanted to make a syrup. How long will it last in a jar or is it better to freeze it for future use. Has anyone tried it? I think it would be fine in the fridge for about a week. Any longer than that and I’d freeze it. I wouldn’t attempt canning it. This looks so good! Did you have to add any water? Or were the peaches juicy enough? If you use ripe peaches, they’ll release a lot of liquid into the pot and you won’t need to add any water. as a single user, I don’t know that I would use an entire cup of syrup in a week’s time… can it be frozen? We haven’t tried freezing this, but most simple syrups freeze just fine, so I think it would be okay!